It's almost time to welcome Spring and Summer! I love this new stamp called "Ribbon Girl" from Queen Kat Designs. Today I am showing another way to use this super cute image. She reminds me of a carefree childhood. I think, for that reason, she is perfect for using in an art journal. 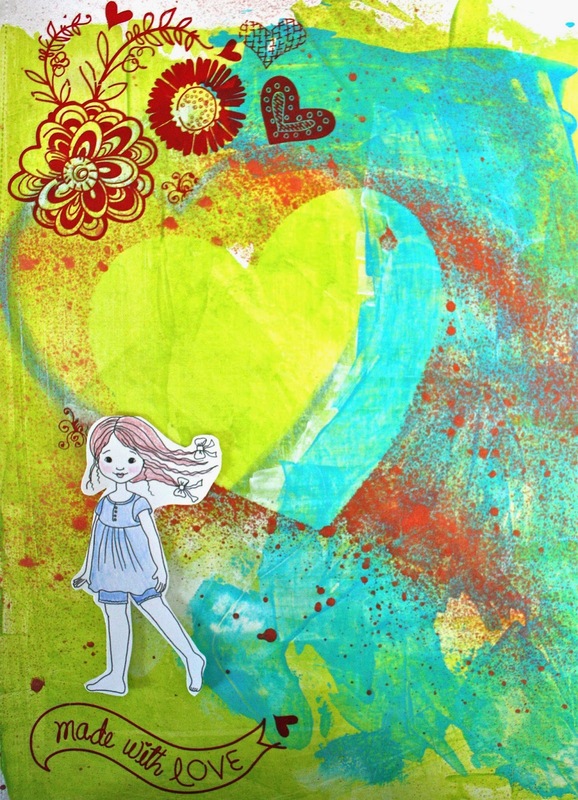 So, I am taking you inside my art journal to show you how I used this image. First up close and personal! I colored her this time with colored pencils in shades of blue, which is my favorite color. The journal background on this image is completed with acrylic paints which were scrapped on with a credit card. I also used mists, stencils and rub ons. Here is the page in its entirety. I still have space to write inside the heart when the mood strikes and I want to take time to write down a childhood memory. Thanks for stopping by! I am off to a very special wedding where I will be using one of the cards I created with the sweet double wedding birds, I featured last month! Check them out!